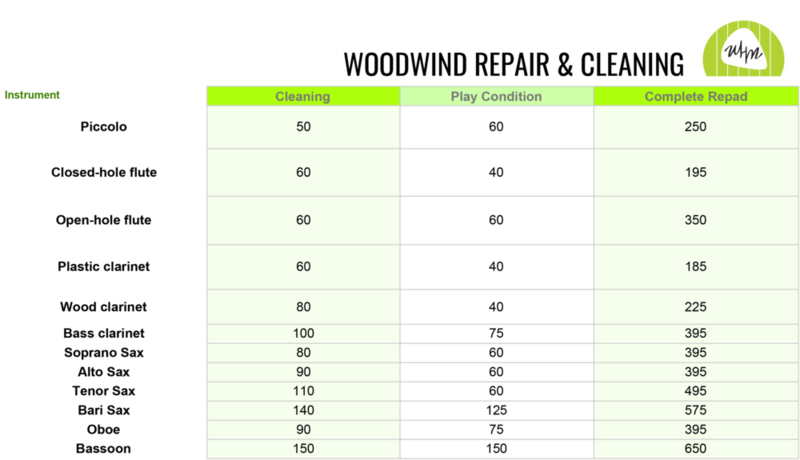 Below you will find a description and pricing for common repairs on woodwind instruments. All work is done either on-site or at our home shop. We guarantee our work for 6 months after the repair completion date. Less common instruments not listed here such as bass flutes, alto clarinets, C-melody saxes, English Horns, contrabass instruments etc. will be estimated upon inspection. Cleaning: Includes complete disassembly of the instrument, sterilization and, on metal instruments, chemical cleaning. Silver-plated instruments are polished or wood instruments are oiled ifnecessary. Keys are hand cleaned/polished and instrument is reassembled. Play condition: May include, but is not limited to, minor replacement of pads and corks, alignment of keys, regulations, levelling or reseating pads, securing loose threads. Prices may vary. Complete repad: Includes complete disassembly and cleaning of the instrument and keys. Silver-plated instruments are polished and wood instruments are oiled if necessary. All pads, felts, key corks, and tenon/head corks are replaced. Key heights are regulated. Unnecessary lost motion is removed from keywork. Mechanical noise is reduced or removed. Minor dents are removed and frozen keys are freed. Key articulation is regulated. Instrument is play tested. Case is cleaned.